A mum from Dundee had unknowingly carried a million pounds in her handbag for days. Shaheen Akhtar only remembered to check a ticket she had bought from The Newsagents at 125 Albert Street, Dundee when she spotted it in her bag. When she checked the results on TV, she discovered she was a millionaire. 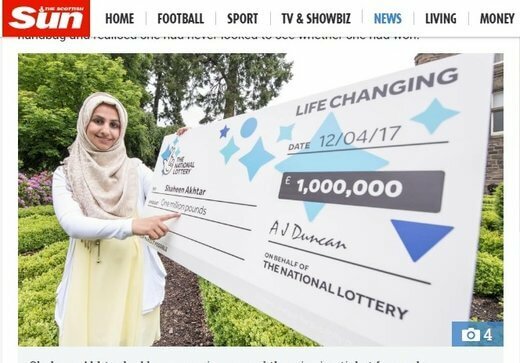 Her ticket’s raffle code matched that of the 12 April draw, earning for her a million pounds outright. But having only won a maximum prize of £250 previously, she found it hard to believe her luck. So she brought the ticket to the store she bought it from and had it checked. When the shopkeeper told her to contact the Lottery office, she knew it was real. And that’s when she started calling her family to relay the good news. Now she is planning to purchase a bigger home where her children can have their own rooms. She is also planning a shopping trip to Dubai to splurge a little on herself.